President Donald Trump is suddenly obsessed with the growing federal deficit, according to a new Washington Post report. Trump’s major legislative achievement, the GOP tax law, is a big driver of the exploding deficit. The possibility that Trump will actually act to reduce the deficit is slim. The president is still pushing deficit-busting ideas, and House Democrats are unlikely to get on board with any major deficit-focused bill. President Donald Trump is suddenly very interested in reducing the federal deficit, which is on the rise after two years of debt-adding policies pushed by the president. According to a new report from The Washington Post, Trump has demanded that Cabinet officials work on a way to reduce the federal deficit. He apparently has repeatedly expressed concern over the past few weeks about the growing amount of debt the federal government is taking on. Trump requested that the officials cut 5% from their budgets and is looking for other ways to bring the exploding deficit under control. 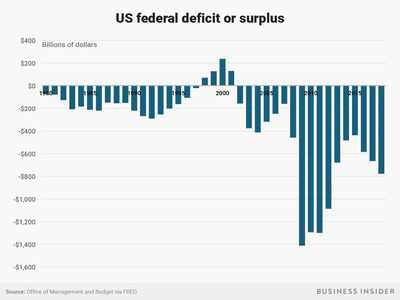 The impetus for the concern, according to The Post, was the Treasury Department’s report in October that found that the federal deficit grew to $US779 billion in fiscal 2018 (from October 2017 to September), the highest annual budget deficit since 2012. The new focus is a major departure from Trump’s previously dismissive attitude toward the deficit. For instance, the Post article confirmed an anecdote in the journalist Bob Woodward’s latest book, “Fear: Trump in the White House“: When Gary Cohn, Trump’s former economic adviser, brought the issue to Trump’s attention, the president suggested the US could simply print more money to pay off the debt and did not appear fazed by the possibility of a rising deficit. This attitude toward the deficit was also reflected in Trump’s major legislative pushes in his first two years in office. A substantial contributor to the deficit is Trump’s signature legislative achievement, the GOP tax law, which the Congressional Budget Office estimated would add $US1.5 trillion to the deficit through 2028. 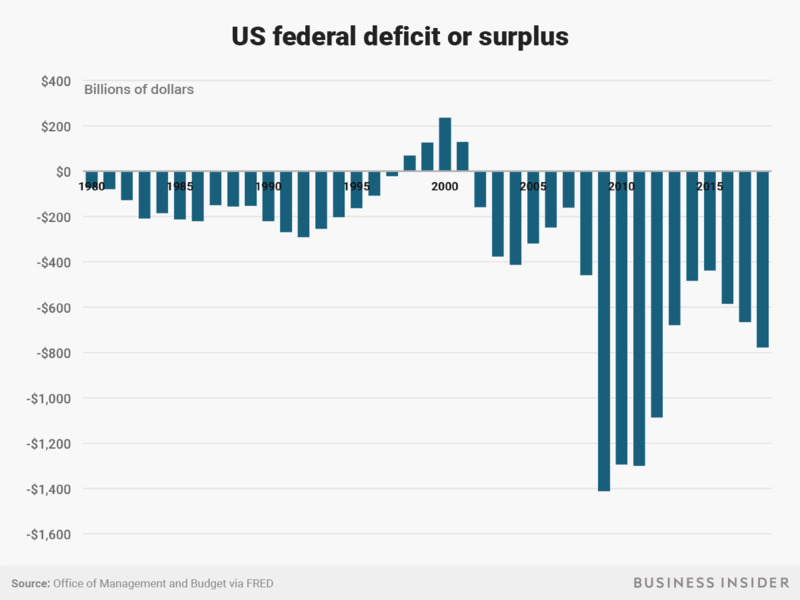 Despite promises that the law would not add to the deficit, it has already helped to push the federal government’s borrowing levels to their highest since the depths of the financial crisis. Other legislative actions during Trump’s time in office are projected to have an outsize effect on the deficit over the next few years. 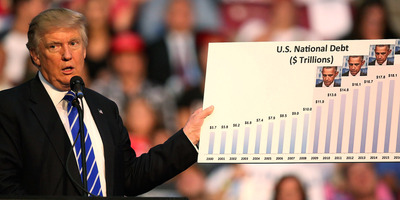 The Committee for a Responsible Federal Budget estimated that $US262 billion of the fiscal 2018 deficit, or roughly one-third of the total, was caused by legislation passed under Trump, and $US445 billion of fiscal 2019’s projected deficit, or roughly 45% of that total, would be caused by new measures. In total, the group projected that the new legislation would add $US2.4 trillion in new debt through 2027. But despite Trump’s sudden interest in the debt, the Post report shows that the president has no clear plan to address it. Trump is still pushing for a variety of policies – such as another tax cut for the middle class and a large infrastructure package – that would add a substantial amount of debt. But even if the president did assemble some sort of spending-cuts package, the newly divided Congress would be unlikely to pass any sort of major cuts. The one item that is consistently floated as an area where Trump and House Democrats could possibly work together – infrastructure – could add even more to the deficit.